If you could interview the members of one of your favorite bands before they played a stadium show, what would you ask them? Think about it: Their music is the soundtrack of your life, from your teenage years into adulthood. You played guitar along with every riff, every melody, and every solo of “Master of Puppets” so loudly, so many times, your neighbors were banging their heads (ah, but in frustration…). Any time you needed an extra dose of energy before a big game, a big exam, or heck, just to cut the grass, “…And Justice for All” was like a mainline of adrenaline to your soul. 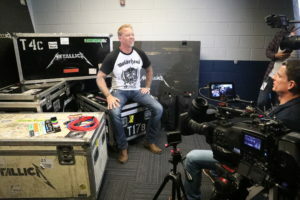 So what would you ask Metallica – James Hetfield, Lars Ulrich, Kirk Hammett, and Robert Trujillo – before they played Detroit’s Comerica Park, that you possibly don’t already know, and they haven’t been asked hundreds of times before? I am no longer the teenager with rock-and-roll dreams, but that experience still forms part of who I am today: Father, husband, journalist, and somewhere down the list: someone with a deep appreciation for the beautiful, violent music that is Metallica, even if I can’t explain it to my wife, who, god bless her, will sing “Hungry Like the Wolf” again and again (and not sotto voce), but doesn’t know “Fuel” from “Seek and Destroy.” I remember what it’s like to play in a band, but I’ve never had tens of thousands of people singing back to me lyrics that I wrote in a garage, or in a basement, 30 years ago. I’ll be honest: For the three decades I’ve listened to Metallica, I’ve never associated their music with the word “groove.” But it’s true. Listen to the opening riffs of “Master of Puppets”, or “Enter Sandman”, or “For Whom the Bell Tolls.” Hear the groove? I do now. Metallica is in the middle of a year-and-a-half-long world tour covering 96 shows across the Americas, Asia, and Europe. The WorldWired Tour is the band’s first North American tour in eight years, and their first stadium tour in 20 years. It’s a massive production: The stage alone takes three days to build. But what I found more interesting than that massive stage spanning Comerica Park’s outfield, the huge video screens, and the pyrotechnics that make up Metallica’s WorldWired shows, was where each show starts: In a small room, just big enough for a drum kit, three microphones, and a couple of sound monitors. 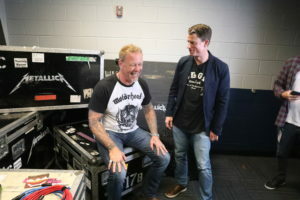 About an hour before each show, Metallica gathers in what they call the “tuning room”, somewhere deep in the bowels of the stadium, to knock the rust off and check in with each other. It is the very essence of a garage band: four guys packed into a tight space, jamming, goofing off, and mugging for their friends watching. For Metallica, this time is also used to go over some of the deep cuts that vary from show-to-show. That never happened to me. But that’s why Kirk is Kirk, and I’m… well, not Kirk. Since 1983’s “Kill ‘Em All”, Metallica has sold more albums worldwide (110 million) than there are people in Germany, France, or the United Kingdom. Since 1991, when Nielsen SoundScan began tracking album sales, only the Beatles and Garth Brooks have sold more albums in the U.S. than Metallica. Not Adele. Not Jay-Z. And not Taylor Swift. So has it all gone to their heads? Are they impossible to talk with? Not at all. For the brief time we were together, they were just normal guys, talking about what they do and why they do it. That wasn’t a question I asked, but that’s what I’ll always remember about my time backstage with Metallica.